These Easy Puff Pastry Cherry Turnovers are light, flaky, filled with cherry pie filling, then topped with a drizzle of glaze. Whether you make these for breakfast or dessert, they will be a favorite for years to come! One of my favorite treats growing up was the Cherry Turnovers from Arbys. I remember riding in our minivan with all my sisters and we stopped to get some Cherry Turnovers and drove around looking at Christmas lights. Whenever I eat a Cherry Turnover it’s like I’m right back in 1995! 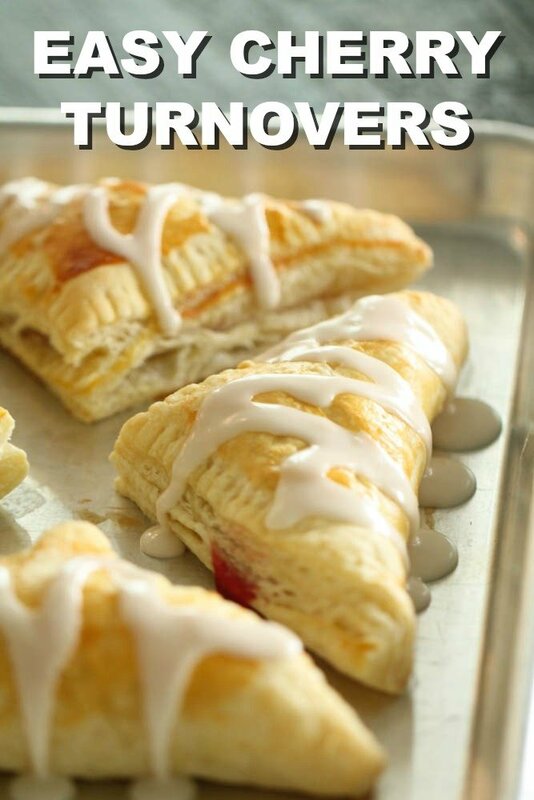 I can smell and taste those sweet, flaky turnovers like it was yesterday. These Easy Puff Pastry Cherry Turnovers are so easy to make and only use a handful of ingredients. This is a great recipe to let your kids help with. My kids are experts at sealing the edges of the puff pastry with forks and drizzling the glaze on top. 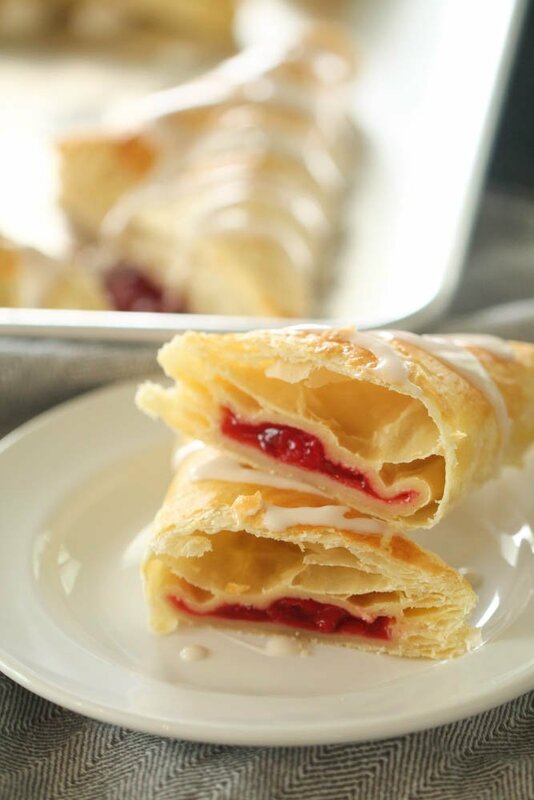 You only need a few minutes and 6 ingredients to make these Easy Puff Pastry Cherry Turnovers. Step 1: Preheat oven to 375 degrees F.
Step 2: Unwrap puff pastry dough and cut each sheet into 4 squares. You don’t need to roll your puff pastry out, simply use your hands to press out any seams if necessary to make it smooth and flat. Step 3: Place 2 Tablespoons of cherry pie filling in the middle of each square. Be sure not to overfill, or the pie filling will come out of the sides when cooking and burn. Step 4: Brush the edges of each square with egg and fold in half to create a triangle. Step 5: Use a fork to press and seal the edges of each turnover together. Step 6: Brush extra egg wash on top of turnovers. This will help them get nice and golden brown on top. Step 7: Place turnovers on a greased baking sheet and bake for 20-25 minutes, or until golden brown. Let cool. Step 8: In a small bowl, whisk together powdered sugar, milk and vanilla to create a glaze. Step 9: Drizzle glaze over turnovers and serve. Our family loves eating these Easy Puff Pastry Cherry Turnovers for breakfast on the weekend. What do you think? Are these for breakfast or dessert? Flaky puff pastry filled with cherry pie filling and topped with a sweet glaze. Unwrap puff pastry dough and cut each sheet into 4 squares. Place 2 Tablespoons of cherry pie filling in the middle of each square. Brush the edges of each square with egg and fold in half to create a triangle. Use a fork to press and seal the edges of each turnover together. Brush extra egg wash on top of turnovers. Place turnovers on a greased baking sheet and bake for 20-25 minutes, or until golden brown. Let cool. In a small bowl, whisk together powdered sugar, milk and vanilla to create a glaze. Drizzle glaze over turnovers and serve. WoW! I'll be making these. Looks delicious, I will be making these! I will be making these as well, so easy! :) I wonder... could you substitute Nutella for the pie filling and not goof up the chemistry of the whole thing? I think that Nutella would be AWESOME in these! Such a great idea!! Could you make extra and freeze? 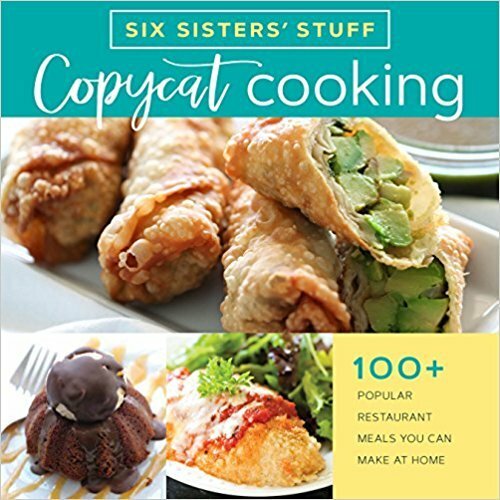 what a great and easy recipe! I would try to make those with fresh fruits, though. Simple idea - and they look fabulous! I must try this too! YUm! I will make these for my kits. Perfect way to use up some leftover cherry pie filling! This is exactly I what I was looking for! I normally make fresh apple turnovers using frozen pastry sheets. I add brown sugar and cinnamon to the apple mixture in the saucepan. I am now looking for different varieties and easier method of baking these as special morning treats and desserts........Could I add brown sugar to the cherry filling? I am going to try to bake some tomorrow but wanted to know if anyone has attempted adding brown sugar to a canned fruit filling? Do you have to turn them over to brown on both sides? No turning necessary. They will brown on the top and the bottom browns being next to the pan.